December has been a busy month in our house. We’ve had the builders finish a loft conversion, a manic weekend of painting and shifting furniture about, a third birthday (to be blogged about shortly), a thirty sixth birthday, Christmas and amid all of that our newest little addition was born. 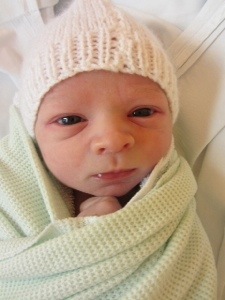 Born on the 16th December at 9.27am, weighing 7lbs5oz, by elective cesarean. The whole experience was so vastly different to Elliot’s traumatic entry to the world, and as a consequence the transition from a family of three, to a family of four, has been relatively plain sailing so far. Alexander has been putting on lots of weight already, and is pretty easy to look after. Elliot seems to like his new little brother and has only asked me to put him down a couple of times. So, all in all, I’m really enjoying being a mummy of two. Two boys. My sons. Wow. This entry was posted in Alexander, Family, Story and tagged alexander, Birth, Family. Bookmark the permalink.